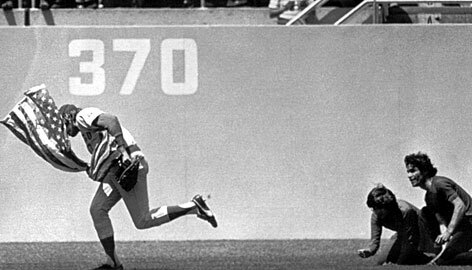 On April 25, 1976 at Dodger Stadium in Los Angeles California, two radical fans (a father and his 11 year old son) jumped the outfield barrier wall and ran onto the playing field carrying an American flag. After crouching down in center field, they attempted to incinerate the flag in front of thousands of shocked and booing fans. The incident occurred in the fourth inning of a game between the Los Angeles Dodgers and the visiting Chicago Cubs. Upon witnessing what was about to go down, Rick Monday, the 30 year old center fielder for the Chicago Cubs immediately sprinted towards the duo and grabbed the flag seconds before it was set ablaze. Monday then calmly walked over to Dodgers starting pitcher Doug Rau and handed the flag over to the sounds of thunderous cheers from the crowd. The father and son were later apprehended and arrested by ballpark police officers. When Monday came to bat in the next inning, he received a standing ovation and was greeted by a special message on the score board that read: RICK MONDAY…..YOU MADE A GREAT PLAY. What makes this an extraordinary story is that Rick Monday (now 68) was a Vietnam veteran who served in the United States Marine Corps Reserves (an ROTC commitment established at his alma mater Arizona State University) prior to his 18 year career as a professional baseball player. On August 25, 2008, Monday was presented with an American flag flown over the Valley Forge National Historical Park to honor the April 25, 1976 event. To this day, Monday still possesses the original flag he rescued from destruction. You made a great play Rick Monday. God bless you Sir and God bless America.